ColorChecker Classic Card is rated 4.7 out of 5 by 103. Rated 5 out of 5 by UC_Bluenoser from When you need accurate colour I use the Colorchecker for two things, making sure colour is accurate when I capture an image and verifying exposure. It is indispensable when you are doing product shots. I usually have my camera tethered and I use the gray squares to check exposure at the time of capture. The full chart can be used with ACR Calibrator to profile your camera when using Adobe Camera Raw. I also use the gray squares with the eyedropper in ACR to quickly colour correct images. With the ColorChecker and a well managed workflow I can get accurate prints the first time. A great time saver and highly recommended. Rated 3 out of 5 by mike from ColorChecker Classic Just set it up through their website, you have to download the software to your computer. The company really wants to move on to the Colorchecker passport and makes it a little hard to find the classic on their site. At the price for what amounts to tougher coated cardboard color squares they are kind of expensive for what you get and should include the software on a disk with the kit. Probably should have gone with the Passport but for what I was looking for I thought the Classic was expensive enough. B&H was good to order from and everything went as they indicated in their conformation email. Even though I think it's too expensive for what you get I would recommend getting the Passport instead. Rated 5 out of 5 by Zorian from Perfect Color and Density The chart is made of durable plastic. The colors are durable and are matt finished so that they do not easily flare or glare when you you are shooting a test picture. Put the color checker in the picture you are shooting for a test shot and you have a perfect raw or jpeg, color and B+W reference. The #2 grey step is perfect for white balancing your pictures in photoshop raw. 18 color steps and 6 B+W density steps. Worth every penny. Rated 5 out of 5 by Norm from ColorChecker Card is Indispensable This is perhaps the simplest and best way to ensure that your colors are correct and that they print at they should. Just include the the card in one shot in a series and it becomes the color standard for them all. Once in Photoshop or some other Post Processing software, click on a color square and all of your colors are suddenly corrected. This process is simplified, but essentially correct. Very useful for both indoor and outdoor shooting as well as for creating camera profiles and much more, but be careful to keep it safe from rain and do not get oils from fingers on it or the colors will change and quality will be reduced. I highly reccomend it. Rated 5 out of 5 by 0149 from Shoot First, Adjust in Post-Processing As a film user making the transition to digital, I have had to re-learn many things, and to switch from the darkroom to Photoshop. I often adjust color and the exposure, but now I have a ritual, where I start a session or series of shots with the ColorChecker, and a B&W crisp focus card. No matter where you point the lens, to AF looks for a strong contrast to hone in on. These two tools allow me a crispness and accuracy which speeds up the post-processing time. Rated 5 out of 5 by Anonymous from works greate with Davinci resolve 11 I use it like a clapboard at the start of shots for use in preprocessing color using Davinci Resolve 11. It works as well as more expensive cards programmed into resolve 11. -asked Black Magic person at new york Black Magic event on Aug 13. Rated 4 out of 5 by Anonymous from Color Checker I used this color checker to create Lightroom profiles for my Canon 40D. This would help to create scientifically accurate color. The chart works fine with the scripts available online but the big downfall is the chart is expensive. How long can I use this? X-rite told me that I need to get a new one after several years. 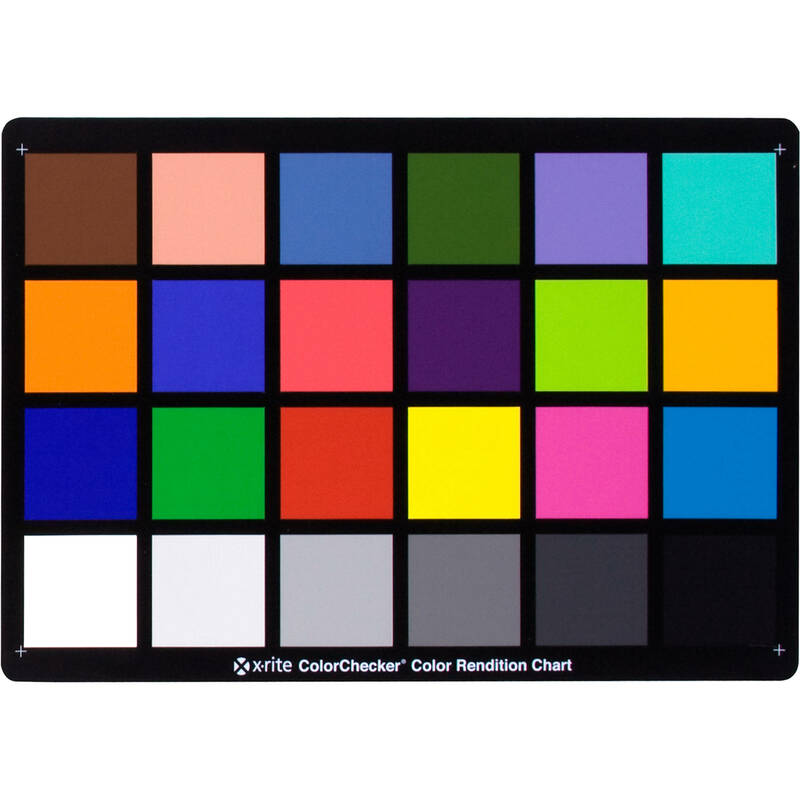 X-Rite recommends that you change your Color Checkers out every 2 years. What material is the ColorChecker printed on? Paper, plastic, metal? How durable is it? The X-Rite Original ColorChecker Card is printed on plastic. It is very durable. what is the life of Macbeth Colour Checker card?what is the validity period? x-rite recommend replacement of the color chip cards every 2 years. yes the case is plastic but the color chips are ink, and will fade over time. finger grease etc will also affect the colors. Does the X-Rite Original ColorChecker Card come with a cover or case? Yes, the X-Rite Original ColorChecker Card comes with a protective sleeve. I wish to color calibrate my scanner, Photoshop and my printer. Is this an appropriate device for my needs? If not, what would you suggest?Where can I read the instructions on how best to use this device, assuming it meets my needs? Is any of those gray patches the 18 percent one and the black patch glossy? Is this version any better than the Passport version for still photography? How? &quot;And because it is bigger you can put it where you want it in the shot which is where the actors are&quot; Well, that depends on the type of photography, doesn't it? What if you're shooting macros at 1x or greater magnification and want a color reference? Both are too big. Have anyone figured out a way how to mount this card to a lightstand/baby pin? Alli-clamp might warp it. Any other ideas? There are many ways to hold the card to a stand.Some are listed below.